Do you only work with companies in Austin/Texas/The United States? No! We’re based in Austin (and we love it here), but we frequently partner with companies in different cities across America. We haven’t worked with a company based in another country yet, but we’re open to the possibility. Do you focus on B2B or B2C marketing? We primarily focus on B2B, mainly because the marketing for B2B is much more trackable. Our strategies can work for B2C companies, too, but that’s not our particular area of expertise. Do you guys do websites? We can do websites. We mainly focus on improving existing websites for accomplishing business goals, like sales or lead generation. If you want to start from scratch, we’re happy to talk to you about the possibility of working together. Sure, we occasionally do projects. But be forewarned that people often end up keeping us around after we’ve finished an initial project because they like the work we do so much. Yes! Marketing is a continuous process, so retainers are ideal; our best work often comes out of long-term partnerships. They allow us to really understand the business, keep everything up to date, and make strategic decisions. At a high level, an inbound marketing strategy involves creating useful, valuable content to bring people to your site, build trust, convert visitors into leads, and nurture them until they’re ready to talk to someone on the sales side. For more information, check out HubSpot’s intro to inbound marketing here. HubSpot is an inbound marketing platform designed to help you run your whole online marketing operation. It works best in conjunction with an inbound strategy. 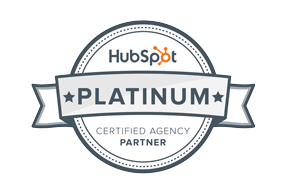 What’s your relationship with HubSpot? We’re certified value-added resellers, which means that they’ve put us through the paces, and we’ve come out the other side. We’ve worked with HubSpot to learn the ins and outs of their system and methodology, and are able to help other companies get the most out of it. Why should I buy HubSpot from you? We tend to partner with companies that need assistance getting the HubSpot system integrated into both their existing software systems and into their general working methods. Because of our deep expertise on all things HubSpot, we can work with you to tailor the system to meet your company’s needs, and we can train your team to use the system so that you see maximum benefits from your investment. We already have a full marketing department. What can you do? If you have a full marketing department that can run an inbound strategy, great! We can help you with HubSpot implementation, set-up, and training. From there, we can either continue to help coordinate and refine your inbound strategy, or we can step aside and perform periodic check-ups. We don’t have a marketing department. What can you do? We often work with companies that don’t have their own marketing departments, but realize they need a marketing strategy in place. In that case, we can partner with you to act as a virtual marketing department. Depending on the scope of work you need, we can also bring in additional individuals as needed to handle parts of the marketing operation.